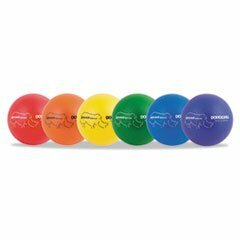 --- Low bounce ball made with Rhino® skin patented tear-proof, safe, no-sting coating. High-density foam core is ideal for group play. Durable for outdoor use yet designed for indoor use. Diameter: 8"; Material(s): Foam; Rhino® Skin; Color(s): Blue; Green; Orange; Purple; Red; Yellow. If you have any questions about this product by MOT3, contact us by completing and submitting the form below. If you are looking for a specif part number, please include it with your message.